"Sampath Speaking" - the thoughts of an Insurer from Thiruvallikkeni: Artificial intelligence Vs humans ~ En Iniya Enthira ~ shop bot sacked !! Artificial intelligence Vs humans ~ En Iniya Enthira ~ shop bot sacked !! What is your personal take on Private Company culture of hiring people and then sending them off in a whiff ! - a few decades ago, people joined smaller private concerns, worked for life and retired peacefully and happily too ! 2.0 ~ the sequel to Rajnikanth starrer ‘Enthiran’ could suffer matching the expectations – as the original kept the audience glued to its storyline – all credit to Sujatha, the great writer and the director Shankar. Dr Vaseegaran, a scientist working on alternative intelligence develops a humanoid robot which gets rejected by sinister designs. At a point of time, the robot ‘Chitti’ asks why he has not been provided with ‘emotion’. Dr Vaseegaran reprogrammes it with human feelings and emotions so that it could distinguish between right and wrong. However things go wrong when Chitti falls in love with Sana (Aishwarya). The making of Chitti and developing its functions was well depicted – I felt saddened when Chitti is dismantled [rather asked to self-destruct] and dumped in Perungudi garbage ! That was not much - when compared to the lumpen feeling reading the travails of the little Jeeno, in the most interesting Sci-fi of Sujatha - ‘En Iniya Eyanthira ’ and Meendum Jeano – the story of robotic dog woven subtly around a dictator who keeps the Nation under tight grip. The real identity of the Head when known at the end was the real classical revelation. The pet robot dog which can think beyond humans, assists the dumb Nila in search of her spouse Sibi into bigger things. Towards the end, the cute exceptionally dog loses it memory and back up and fades away !I felt very sad reading of its end - illogical it might sound, it was after all a story – yet !! Anything on the topic of ‘AI’ would eventually meander into – robots replacing or challenging humans ! ~ there are always two sides. Humans can never match the systematic duplication thousand-folds that robots can do. Robots will do and keep doing a work – thousandth time too with the same precision and without any tiredness or considering it mundane. While AI can decipher and replicate all that is programmable i.e., actions that can follow any set pattern, irrespective of the no. of probabilities :-: walk into Ritchie Street in Chennai and observe how the small boy(in all probably illiterate) display loads of intelligence in disassembling and putting in parts for any latest gadget. The practical knowledge and understanding of complex issues is simply amazing ! 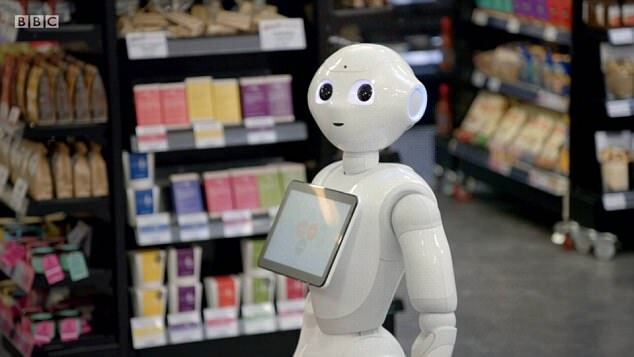 Fears that robots could take the jobs of humans may be premature after Britain’s first cyborg shop assistant was sacked after a week of confusing customers.In an experiment run by Heriot-Watt University for the BBC’s Six Robots & US, Scottish supermarket chain Margiotta was asked to trial ‘ShopBot’, who they affectionately named ‘Fabio’.Fabio was programmed with directions to hundreds of items in the company’s flagship Edinburgh store and initially charmed customers with his ‘hello gorgeous’ greeting, playful high fives, jokes and offers of hugs. We thought a robot was a great addition to show the customers that we are always wanting to do something new and exciting,” said Elena Margiotta, who runs the chain of shops with father Franco and sister Luisa.But within just a few days, the robot was demoted after giving unhelpful advice such as ‘it’s in the alcohol section’ when asked where to find beer. He also struggled to understand shoppers’ requests because of the ambient background noise.Banished to an aisle where he was only allowed to offer samples of pulled pork, Fabio started to alarm customers who went out of their way to avoid him. Interesting !~ yet cannot be taken as the final word on human / AI conflict.